When most people imagine a theme park, they picture an elaborate set of exotic attractions with unusual themes - Egypt in the Midwest, tropical jungles in Oregon, fantasy castles in Orlando. Adventureland, however, has a much more classic approach to family fun: good, basic amusements without unnecessary embellishments. The park's rides are brightly colored but without interwoven layers of meaning that distract from the old fashioned good times they offer. The 180 acre resort area encompasses everything from thrilling high tech rides and refreshing water rides, to music and magic, to burgers and corn dogs - all with a nostalgic, Americana theme that anyone can enjoy. Young and old alike will appreciate the more than 100 different attractions this Iowa amusement park offers, from amazing rides to enchanting shows, with tasty treats in between to keep up visitors' energy. Space Shot: This ride towers 235 feet above the park and launches riders into orbit at an amazing 4.5 times the force of gravity. Outlaw: A rambling, twisting wooden roller coaster, this ride reaches speeds higher than 50 miles per hour along its clattering course. Giant Skywheel: A classic feature of any amusement park, this Ferris wheel is nearly 100 feet tall and is adorned with 6,000 lights, making it a spectacular icon at the front of the park. Dragon: Guests interested in a fiery thrill will appreciate the Dragon's double loop inversions along its steel tail. Raging River: A quarter-mile of rapids, waterfalls, and waves makes this white water rafting adventure a riotous splash sure to cool guests on even the hottest summer day. Saw Mill Splash: Travel down Adventureland's waterslide giant in a rubber raft for sure summer fun. Your raft may spin as it rips down the spiraling slide path and you are almost guaranteed some cold splashes. In addition to these big thrill rides, guests can enjoy the classic fun of the park's bumper cars, log flume, tea cups, Himalaya, carousel, and other amusement rides. Kiddie rides are scattered throughout the park to offer the youngest visitors something fun no matter where they may be. To take a break from the fast-paced rides, many Adventureland theme park guests opt for the park's shows and other entertainment. Bernie Bernard, the costumed mascot, is a friend for any guest, while choreographed music, magic, and comedy acts offer more structured entertainment. Guests may be surprised by the antics of the strolling band, and the colorful landscaping features more than 100 species of flowers and trees to bring beauty to every corner of the park. Adventureland also frequently hosts special events, such as circus appearances and craft shows, to add even more entertainment to its seasonal roster. From quick snacks to delicious meals, guests can find many types of classic amusement park fare to tame rumbling tummies at Adventureland. Treats include burgers, pizza, fried chicken, barbeque sandwiches, kettle corn, ice cream floats, nachos, and the ubiquitous gastronomical delight of all classic amusement parks, the giant-pickle-on-a-stick. Guests planning a visit to Adventureland theme park will be pleased to discover its adjacent hotel and camping options, as well as the various ticket prices that offer deals suitable for different guests' needs. 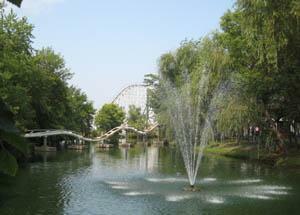 The park is advertised as Iowa's largest family resort and is located just northeast of Des Moines. The operational calendar varies, but generally runs from April through September, though early and late in the season the park is only open on weekends. Part of the Adventureland resort complex includes two different accommodations just minutes from the park, the Adventureland Inn and the Adventureland Campground. The Inn boasts two tropically-themed pools and a spa area as well as standard rooms and suites to provide a peaceful retreat for any size family. The Campground is a full-service facility with tent areas and its own pool. Both the Inn and the Campground offer free shuttle service to the park, letting guests enjoy their visit without fretting over crowds or parking. General admission tickets for Adventureland theme park are $31 for adults and $27 for children and senior citizens. Special needs tickets are $21 for guests unable to enjoy the park's more rigorous attractions due to pregnancy, casts, or other physical limitations. All guests can take advantage of second day discounts for just $15.50, and group and corporate discounts are also available. Standard parking rates are $5, though oversize vehicles and RVs may be required to pay a higher rate. Check local grocery stores (such as Hy-Vee) and credit unions for discount tickets to Adventureland. Adventureland is near Des Moines.